Pastor Masamoto Higa of International Family Church in Takasaki, Japan began a fast on March 1st. He was seeking to hear from God. At 2:46pm on the eleventh day of his fast, the 9.0 earthquake hit and minutes later, the tsunami swept in then out, ravaging lives and families, cities and villages. As images flashed across our screens, the nation and the rest of the world watched in utter horror. The devastation was immediate, immense, and incalculable—maybe even hopeless. "God has burned in my heart those 86 cities and villages and towns completely wiped away—[that they] will have a church in each of the 86 places." And the work has already commenced. 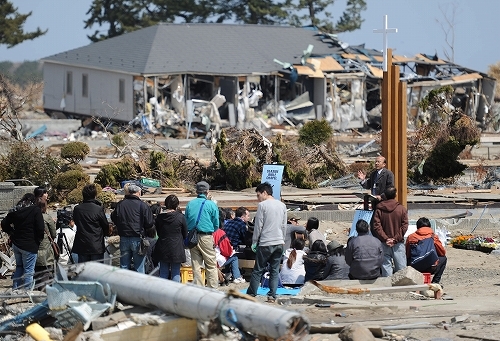 One month after the disaster, on April 10, 2011, members of International Family Church and the surviving members and the people of Seaside Bible Chapel — 50 people in all — held a joint worship service. 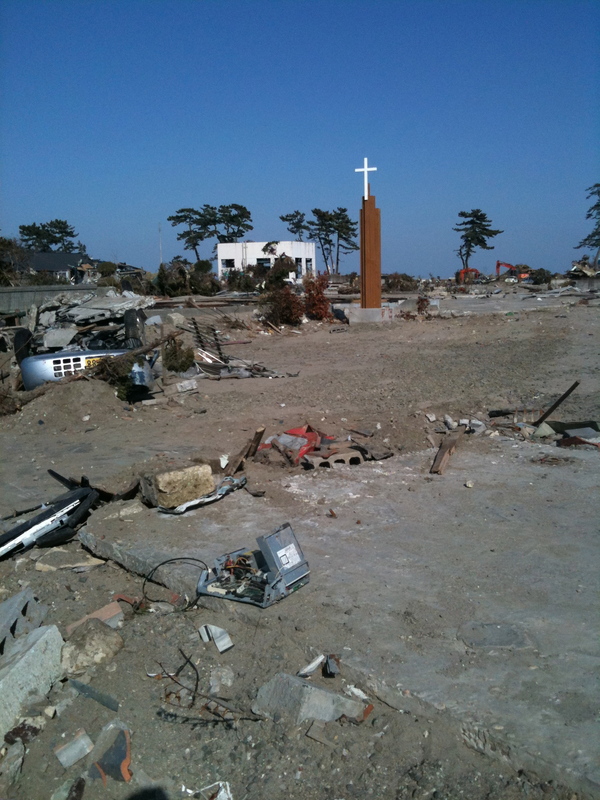 It was held on what remains of the site of Seaside Bible Church—her cross and her foundation. Yes, I think that's rather poetic. The service included a memorial service for those who did not outlive the catastrophe. But the service also included hope of replanting; seeds of hope for churches in this and 85 other communities. Japanese churches are coming alongside of impacted churches to move toward the vision of evangelization of the area by rebuilding the church and starting new churches. Participants proclaimed: 1) We believe in the revival of this place, 2) We believe a special hope in this place, and 3) We love this place. Both Pastor Higa of International Family Church and Pastor Tomohiro Naito of Seaside Baptist Church wrote down these three convictions on the piece of wood and put it up on the site. They believe the new cross tower is built as the symbol of the Hope of the World. Jesus said, "I will build My church." (Matthew 16:18) And by His grace, He allows us to be part of that work. she is His new Creation by water and the Word. Asian Access is called to identify, develop, and release churches to grow and to start churches in the disaster area. We want to help by resourcing Japanese churches and to encourage the Church plant reproducing churches. Will you be a part of bringing hope to hurting places in Japan? I'm humbled by the magnitude of work to be done, but inspired by the hope of God's people with vision.